Handy Equipment Tool Manager for Windows, equipment tool tracking software. "... the price is right and the software has all required features ..."
"... a good balance between power and simplicity ... "
Manage your equipment and tools in seconds. Track where your tools are, who is using them, and when they are due back. Simple and easy-to-use for everyone. Download and try it now! Handy Equipment/Tool Manager is easy-to-use, affordably priced, fully featured asset tracking and equipment management software solution for Windows. 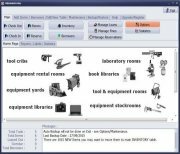 Simple user interface helps you to quickly catalogue your equipment and tool items. Check out and check in feature lets you track who is using, when is using, and what items are overdue. Label and report wizard allows you design and create professionally looking asset labels, barcode labels, or tags. Flexible import tool feature lets you upload your equipment and tool data directly into our program. Equipment, tool management system: review software tour, review how to start tracking your tools and equipment with our windows application. Organize three types of items: unique, inventory, consumable. Construction, manufacturer, and service companies can manage any type of equipment and tools with our software. There is no limit on the number of light or heavy equipment or tools that you can manage in our inventory system. You can track where, who, and when all your company assets are used or placed. Schools, colleges, universities, and educational institutions selected our asset tracking software. Labs, electronic/computer departments, equipment libraries, school sport equipment rental facilities, video equipment departments, school office asset departments, small school warehouses, are using our Windows software solutions. Hospitals, clinics, health care institutions, and non-profits use our items tracking software. You can keep track of who has what and when it is due back.